I realize I might get a little heat for this one, but I feel compelled to speak up based on a Naperville Sun article I read today regarding the relaunch of Naperville’s automated red light cameras which snap photos of cars running red lights at busy intersections. I speak from the experience of my daily commute which takes me to Des Plaines by way of River Road through Rosemont. Anyone who has driven down River Road in Rosemont might agree when I call the stretch of road “Red Light Camera Alley”. Every other traffic light is enforced by the automated enforcers in the sky. First, I do not disagree that there are many busy intersections around Naperville and other citys and towns with track records of accidents. I report to work each and every day to an organization devoted to preventing all forms of injuries. Beyond these cameras being an easy revenue-generator the more important consideration which should be addressed is whether or not these cameras truly improve traffic safety. First, as a seasoned commuter who drives nearly 18,000 miles a year for work (ouch, why did I do that calculation), I pride myself in my own safe-driving practice amidst the morning and afternoon kamikaze “stunt drivers”. My biggest observation is when drivers approach these red light camera intersections they don’t know whether to slam on the brakes or floor their accelerator pedal. Personally, I approach these intersections with trepidation having the knowledge of “big brother” smiling from its lifeless metal box just waiting for the chance to charge me $100 for a violation. In my mind, though I’ve never received an camera enforced ticket (knock-knock-knock), I believe it creates more intersection danger than it solves. Second, on overcast days or in the darkness of winter rush hour, these cameras actually use a strobe-like flash to lure possible violators into the clutches of its sinister lens, which serves as a major distraction regardless of which direction you are traveling. I guess time will tell whether we see a reduction in accidents as I hope that is the case. However, I can say that these cameras seem to create a new form of erratic traffic stress and dangerous driving behavior, even for good drivers who simply want to obey the laws of the road. In the meantime, I have no doubt the cameras will be a good revenue-generator for the City of Naperville. Greetings everyone. I’ve posted the first musical excerpt from the early portions of the score I’ve composed and recorded for Imprévu – The Kenneth von Heidecke Story. 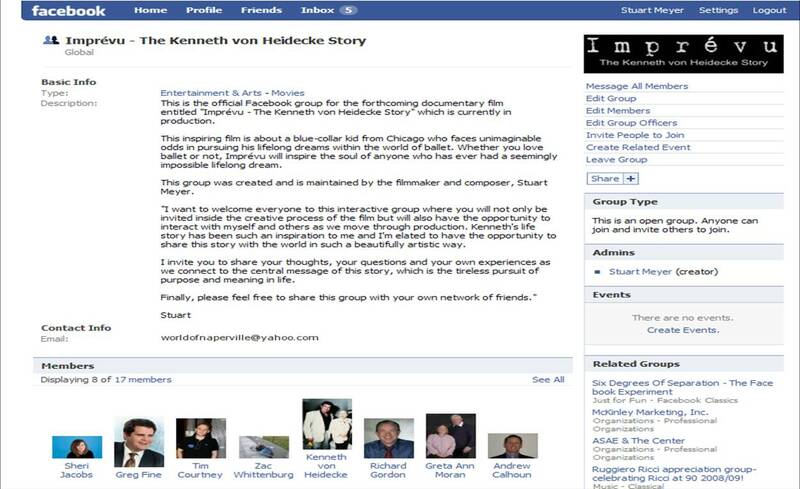 As a means to encourage more of you to join the Imprévu Facebook Group I’ve created for the film, the audio file is posted via a video on the main page. You can access directly by CLICKING HERE . Again, my approach to this film has been to compose all of the music in advance of post-production to strengthen the score’s role as a storytelling element and to celebrate the relationship between music and ballet. All music has been composed based on my own musical interpretation of Ken’s story and has factored into all principal photography. Ultimately, the film will be edited to the music in post-production. I realized how the World of Naperville has been suffering lately by all of the competing demands. The moment actually came when my wife’s Aunt from the DC-area was at our home to celebrate Thanksgiving and she made the observation that I haven’t been posting as often. My sincerest apoligies to everyone as I have really been immersing myself deeply in the film project between shoots and recording sessions for the score. The good news is I’ve created a special Facebook Group as an interactive behind-the-scenes look at the production side of the film. In addition to tracking progress, you can interact with me directly through any thoughts, comments or questions you would like to post. Though I’ve only been up a couple of days, that membership continues to grow.